Do you want to make some money? Do you wish to clear out some of the clutter in your home? Holding a yard sale takes care of both these problems and it doesn’t take as long to gather things for one as you might think. In fact, if you are willing to devote just one day from breakfast to dinner, I think you could come up with hundreds of items to add to your yard sale pile. You would then need to spend a day to getting them ready to sell at the highest prices possible and one more day actually working the sale. Three days work could easily add up to hundreds of dollars in your pocket. I know because I have made as much as $600 in one day selling things found on this list I am about to share with you. 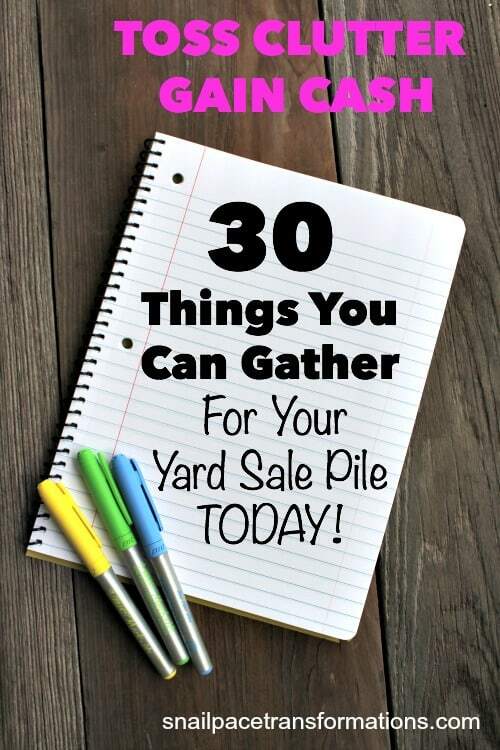 Once you read this list you are going to see that obviously you will end up with more than 30 things for your sale. 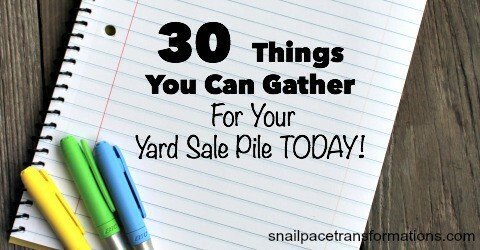 It was just that “30 Types of Things That You Can Gather For Your Yard Sale Pile Today That Will Equal Up To Hundreds of Items to Sell” seemed like a really long title! At the end of this article is a link where you can grab the printable version of this list. Print it out, snap it on a clipboard and carry it from room to room as you start your quest to declutter your home and line your pockets with yard sale earnings. Too-small clothing is usually simple to grab and place in the yard sale bin but don’t forget those clothes that do currently fit, but your child never wears. Like the sweater vest you thought would make your little man look handsome but he refuses to get within 5 feet of. Gently used sporting equipment is a HOT item at yard sales. Soccer cleats, baseball cleats, baseball gloves, shin guards etc, all sell really well as most children don’t use them more than a season and they have lots of wear in them. Chances are your children have at least 1/2 a dozen toys each that they either outgrew or never use. Gently used books sell well and honestly, most bookshelves in our homes only contain a small handful that get read over and over again. Take your child’s collection down to that small, well-loved handful and sell the rest. Your 13 year old daughter probably is not in love with those room accessories she picked out when she was 6. Add them to the yard sale pile and make another 6 year old very happy. Maybe it is too small, or it itches, or doesn’t fit quite right. Whatever the reason–if you don’t wear it, add it to the yard sale pile and make some cash from it. If the exercise equipment is collecting dust or being used to dry towels, it needs to go. Just like you dwindled you child’s book collection above to their favorites it is time to take yours down to what you truly will open and read again. Sell the rest and treat yourself to a new read. Scarves, belts, hats, jewelry–go through it all and keep just what you know you wear. If you can write your name in dust on it, then you don’t really love it. Put it in the yard sale and let someone who loves it take it home and put it to good use. I am talking about actual doubles like 2 can openers and such, but also two entirely different utensils that can serve the same purpose. For instance, if your can opener also has a bottle opener on it you don’t need it and the bottle opener. Toss the bottle opener in the yard sale pile and enjoy a little less clutter in your kitchen. I don’t know about you, but since Pinterest came on the scene I rarely actually use recipe books. If this is you too, add them to the sell pile. Small kitchen appliance that are either still in the box, collecting dust, shoved to the back of the cupboard and have not seen the light of day in at least a year–add these to the yard sale pile. How many storage containers do you really need? I suggest taking your collection down to half and selling the rest. If you could set the table for a party of 20 yet you never serve more than 5, you can put some of them in the yard sale pile. If you allow it to collect dust, you don’t love it so sell it. Chances are these collections hold titles you have not watched, listened, or played in a very long time–sell those. Pillows and blankets can turn a tidy room into a mess in a hurry–sell the ones you are not really using. The coffee table that really is just too small or too large. The lamp that is too short. The free standing cupboard that is so big it makes the room feel really small. Sell these and then go yard sale shopping yourself to find pieces that fit better. You don’t need these–sell them. A few years back I realized that I was loathing decorating for Christmas simply because it had turned into an all day affair. I spent an afternoon taking down our collection to half of what it was and don’t miss anything I tossed. This goes for Halloween decor, Easter, Valentine’s Day etc. Take it down to what is purely essential for your family. Those tennis rackets you haven’t used in years. The roller blades you bought, but never did master. Sell them. Yes, you spent a lot of money on the fabric for that quilt, but if it has been sitting in a bag for 3 years now chances are you are not going to get to it. Put it in the yard sale and let someone who will finish it take it home. Jackets, snow pants, gloves, and winter boots. If there is no one next in line to wear these items or if you have more than one person can wear in one size then in the sell pile they go. What exactly is in that box in the corner of the attic that hasn’t been opened in years. Whatever it is, obviously you are not using it so it should go in the sell pile. Bikes, trikes, push cars, roller skates, skateboards etc—if you or the children are no longer using them, in the yard sale pile they go. If the slide now only comes up to your child’s knees, it is time to sell it and upgrade the play equipment. How many people really do yard work at once? If the answer is one and you have 3 of everything, keep one and sell the other two. Bought a new wrench set, but didn’t get rid of the old one that was missing a wrench or two? Now is the time to sell it. The half box of screws from the fence project, the leftover finishing nails from that cabinet work you did, the old knobs you took off your cabinets and replaced. These things can bring in cash at a yard sale and chances are they won’t be used in your next project. I know the list looks long and overwhelming and if you have more than 1 day, then I would say take it at a slower pace–but if you don’t you can still do this in one day. The trick is to just go into the room you want only to collect the stuff from the list. Do not take time to clean and organize what is left. Simply get the stuff you need for the yard sale and move on to the next area. Also bring boxes into the room with you before you begin and fill them with the items for the sale. Pick one area of the room where you can pile these boxes as they fill up, as well as any other large items that don’t fit in them. Once you are done gathering items from that room, leave those items piled there. You can gather them all the next day into one area when you begin your pricing (if you are doing a young child’s room, you might want to move the pile from their room so that they don’t scatter it before the next day). If you have young children, you may want to arrange childcare else where for your gathering day. There are a few free ways to do this such as doing a child care swap with a friend or asking local relatives to watch them if you can. Plan a simple dinner or even take out for the day you gather your supplies. Also do not do this on a day where you have activities going on that night. You are going to be t.i.r.e.d. Here is an article I wrote about how to prepare your items so you get top dollar. Here is an article I wrote where I share my best yard sale selling tips. These tips helped me with my $600 sale. You can download a free copy of this list when you sign up for my free weekly newsletter. The printable is plain Jane just like I am–meaning it is black ink friendly and easy to read. My weekly newsletter contains a peak into my daily life, a few hot deals so good I have to share and links to all the posts I wrote that week. Get yours here! YES! The house holds tonnes of great yard sale items. Best of luck on your yard sale.